QUẢNG NINH — A chemical factory project, originally set to be opened not far from the World Heritage of Hạ Long Bay, is sparking public concerns in the northeastern province. The factory, which specialises in cleaning agents is planned to produce an annual output of 20,000 tonnes of abrasive lye (sodium hydroxide) in addition to several other agents such as bleach (sodium hypochlorite) and industrial wastewater treatment agent Polyaluminum Chloride (PAC), is based at the Việt Hưng Industrial Park. The position of the 300ha industrial park is already a controversial issue as it lies near the head of Cửa Lục River, which runs directly into the waters of Hạ Long Bay. Phạm Đình Huỳnh, deputy head of the bay management board, said caution must be exercised. 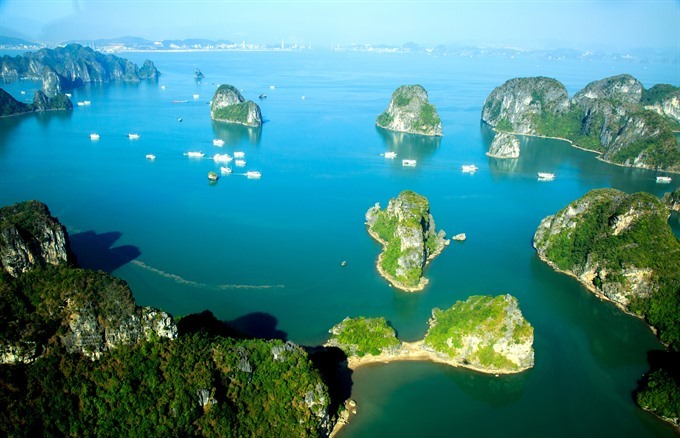 “Should the factory run into leakage issues, the Hạ Long Bay area will be directly effected, which aside from environmental damage, will affect the tourism and service sectors in the province,” he said. In late 2006, Quảng Ninh Province’s economic zone management board and the Tân Tiến Production and Trade JSC, headquartered in Hà Nội, invested in a lye factory. Previously, Tân Tiến received certification from the local authorities to produce alum as its main product (4,800 tonnes a year), with lye on the side (nearly 1,000 tonnes a year). The company has since met the requirements of environmental protection, land planning and workshop construction, and put the project into operation in 2013, authorities said. Two years later, the company requested to expand its production and wanted to build another factory dedicated to producing 20,000 tonnes of lye per year in another land slot within the Việt Hưng IP. Based on opinions from the local authorities and the Ministry of Industry and Trade, the expansion was accepted and the new cleaning agent factory was included by the Vietnamese Government into its national chemical development plan towards 2020. In May 2016, the Quảng Ninh EZ management board granted a new certificate for Tân Tiến JSC to begin the construction of the new factory. Then in March 2017, the environmental ministry approved the project’s environmental impact assessment, which already included its recommendations in case of chlorine leakage incidents. Last month, Quảng Ninh held a meeting with all stakeholders – the investor, environment ministry, industry and trade ministry, as well as scientists – to review whether the investor’s proposals conflicted with the socio-economic development of the local community. At present, Hoàng Trung Kiên, deputy head of the Quảng Ninh EZ management board, said the new project has been suspended and the board is still considering the case and will deliver a final answer to the investor by the end of this month. Industrial projects can only be started when their environmental impact assessment documents, including requirements to ensure the quality of discharged water, are approved by authorities, Trần Đông A, a retired senior expert on planning and environment residing in Hạ Long City, said. “That is on paper. Once the project is up and running, however, investors might actually cut out the whole waste treatment system or operate the system sporadically to save budget, putting the environment at severe risk,” he added.